Ellora Patnaik – Chitralekha Odissi Dance Creation Inc.
Ellora Patnaik has won international acclaim as a dancer and actor, and has performed across North American and India, as well as in the United Kingdom and Iceland. Many revered Gurus contributed to her training including: Srimati Chitralekha Patnaik, (late) Guru Sri Gangadhar Pradhan, (late) Padmabibhusan Kelucharan Mohapatra, (late) Padmashri Pankaj Charan Das, and (late) Padmashri Sanjukta Panigrahi. She has been teaching dance and performing professionally since 1980. Ellora is the Executive Director of the Chitralekha Dance Academy and holds an Associate's Degree from the American Academy of Dramatic Arts where she was a member of the Company in her third year (1994). To her credit as an actor, she has starred in three films: Daiba Daudi (1989), My Own Country (1997), and Tapish (1999), and was a regular cast member of YTV's How to Be Indie (2009-2011). In 1999, Ellora Patnaik received the Kalashri Award from the Orissa Society of Americas in recognition of her cultural ambassadorship and efforts to promote Oriya Culture in North America through Odissi Dance. 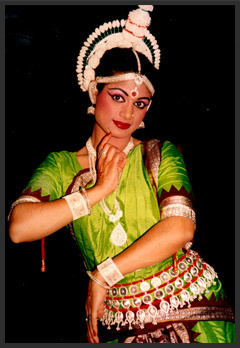 In 2005, she marked Odissi history by performing the World Premiere of the 31-minute solo Abhinaya, Shiva Naba Rasa. In 2006 she presented a 20-minute fusion work of her choreography at the "Wall of Peace" event of the Canadian Museum of Hindu Civilization, which was subsequently remounted severally. In 2009, she choreographed and performed "Timescape" with Devraj Patnaik. In 2012 she directed dance and performed at the Konark Dance and Music Festival in India and toured North America with Devraj.